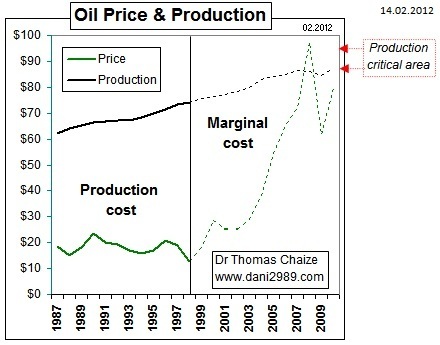 Production cost, marginal cost and price of oil. Today, understanding the evolution of the price of a barrel of oil it is better to focus on the marginal cost at production cost. Rather than ask you a brutally abstract formula to calculate the marginal cost we will proceed with a simplified example to the fullest. Imagine a world with 10 oil wells that can produce 1,000 barrels per day. There are nine oil wells that produce at a cost of $ 25 and $ 100 in the 10th. - If the request is 9 000 barrels per day, the nine wells with a production cost of $ 25 are used. -If the application is brought to 9,001 barrels a day, prices will rise to $ 100 and the 10th will be well used. The daily bill for 9 001 barrels days will be 900 100 $ (9 001 barrels*$ 100). With this new barrel of oil, the production cost increases from 25$ to 25,001 dollars and the marginal price of a barrel of additional 675 100 $ (9 00 100-225 000 $ = 675 100 $). In this example an increase in demand of 0.01% increases the price of 400%, without manipulation, without speculation and without "global conspiracy" of oil companies.